Mr. Hurt, do you know how many times you’ve died on screen? I think I’ve got the record. There is a video on YouTube that shows you dying in at least 40 films. What’s the hardest way to die on camera? [Long pause] That’s very interesting, I’m not quite sure. 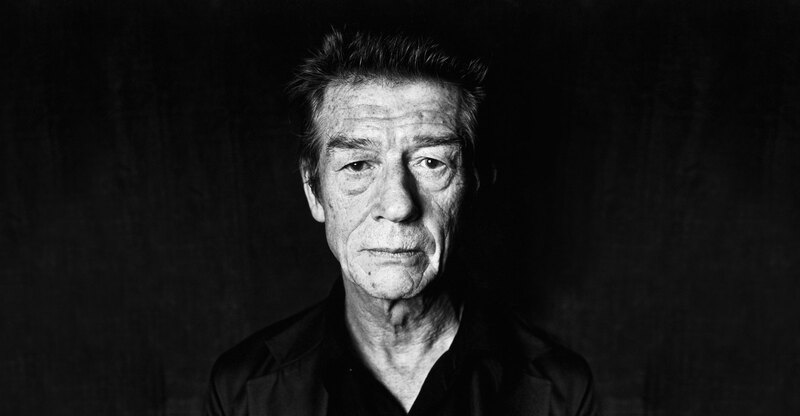 John Hurt dying 40 times. An alien coming out of your chest? That reminds me of your cameo in Spaceballs where you parody that famous scene from Alien. I first got involved with Mel Brooks through The Elephant Man. Everybody knows now, but they didn’t know at the time that he was the producer. Because his name was only associated with comedies? Yes, so he didn’t put his name on it, but what a fantastic producer he was. He was amazing. After that film he kept ringing me up saying, “I want you to do History of the World.” He said, [with accent] “C’mon over John, c’mon! We’ll put you in a nice hotel, give you a couple of grand.” You suddenly find that you’re involved in a scene which is worth millions and you’re getting 2,000 dollars and a nice hotel – that’s it! Very clever, Mel. And then I worked with him again on Spaceballs. "I don’t talk about my ‘work’ – there’s not much work in it is there? I say you play a part, you don’t work one." It sounds like the industry was a lot different back in the ’70s and ’80s. It was. I have to say there was more fun in the business. We didn’t talk about work so much. I’m somewhat old-fashioned and I still talk about playing a part. I don’t talk about my work – “I’ve seen some of your work” – there’s not much work in it is there? (Laughs) So I say you play a part, you don’t work one. Aren’t there some aspects that are a bit of work, like memorizing your lines? That’s the only work side of it really. But, you know, you don’t sit down and learn the lines. At least I don’t. You keep reading it and going over the scenes and looking at it and thinking about it and eventually you know the lines. I supposed science fiction is a bit like work… They are not much fun to make. Some of your most famous work has been in the sci-fi genre. You really don’t care for them? Well, I mean, I’m open to any genre – that is who I am. Essentially I am an actor for hire. I am not a rarified creature. I do all these different things and they all interest me. Well there were moments when I did need to do something because the family coffers were getting a bit low. But Gary Oldman is a very good friend of mine and we talked about this and he works and operates in the same way – except that he is much more commercial than me. “You make more money Oldman!” But, I mean, I don’t mind. But the things that I’ve enjoyed most are not really science fiction. They are not much fun to make because there are so many toys involved. They are fun for directors who like toys, like Ridley Scott, but they are not a lot of fun to make. A lot of hanging around, changing this and that. And then when you play the scenes they are not really that interesting. An American studio film and the amount which is shot on that, particularly with digital because there is no limit to the amount that you can shoot, is endless. They do shots from your point of view, from his point of view, from her point of view, from under your legs, from that corner, from the other corner, from different points of view, three sizes - until you are just bored stiff with the whole thing. They have to do something to make up for the lack of an interesting story. I loved making Midnight Express, for example. You see, we were making commercial films then that really did have cracking scenes in them, as well as plenty to say, you know? You’d find it very hard to get something like Midnight Express off the ground today. I don’t know who would make it. No studio would make it, and it was made by Columbia. And if it did get made, Harvey Weinstein would probably try to cut it down in order to distribute it more widely. He is a bully, you know. I know that he can do that. The films do get more widely distributed, but then that isn’t necessarily better for the film. You can only have a big release for a film that is purely entertaining. Are you pessimistic about the future or do you think the world is getting better? I think one should be very careful of making things cut and dried or simplistic in that sense. For everything that you find dreadful, there’s usually something that is rather marvelous as well. And where humanity is going to find itself in say 20, 30, 40, or 50 years would be very difficult to predict, I think. There are moments of course when you think that it’s going from bad to worse, but there are other moments when you think that human efforts are really flowering into something really fantastic. It’s not something that can be either dismissed or accepted with any kind of simplicity.